Core i7-9700K is an interesting twist on a high-end CPU. The Core i7-9700K ends up as an alternative rather than something that's clearly better or worse than the i9-9900K. It delivers great gaming performance and uses less power, striking an interesting balance between competing features. Intel's Core i7 line has traditionally been the standard bearer for high-end, high performance PCs, often landing at the top of the best CPU charts. With the advent of the Core i9-9900K, however, it enters new territory as a middle ground between the 'extreme' Core i9 and the 'mainstream' Core i5 lines. With eight full cores but no Hyper-Threading, the Core i7-9700K ends up as a net win over the previous generation Core i7-8700K (and i7-8086K by extension). One thing that hasn't changed is the high price, with the 9700K effectively taking over the 8700K's $374 price point. Slightly better performance, in the same socket, for the same price? Yeah, that's not super exciting, but then advances in CPU performance are becoming increasingly difficult. That might not seem true if you look at AMD's Ryzen processors, which were a huge upgrade over the company's previous processors, but the jump was aided by the fact that the AMD FX-series had fallen far behind Intel's Core processors. With the slowing down of process node advances, 5-10 percent improvements in core performance each generation is the expectation. Core i7-9700K does hold a few advantages over the beefier i9-9900K, though. For one, it doesn't use as much power, which in turn means it doesn't get as hot. I wouldn't even consider using an air-cooler with the i9-9900K, but at stock the i7-9700K normally respects the 95W TDP. It's only AVX-heavy workloads that push it into the 115W range—still a far cry from the 150W such workloads showed on the 9900K. If you prefer air-cooling solutions (like the popular Cooler Master Hyper 212 Evo), they should remain viable for the Core i7-9700K, though your maximum overclock might drop a bit. If you look closely, you can see the eight CPU cores next to the larger block of UHD Graphics 630 logic. If you want to know what's changed in the Coffee Lake refresh, check out my Core i9-9900K review, but the short summary is: not much. Intel has tweaked its 14nm process a bit (details on what precisely changed are scarce), added two additional CPU cores and 4MB L3 cache, and is now using a solder TIM between the CPU die and the heatspreader. That last point initially seemed like cause for celebration, and I heard rumors of liquid-cooled 5.3GHz overclocks from the new 9th Gen CPUs. In practice, the actual clockspeed headroom hasn't changed much at all in my experience. I could get lighter workloads up to 5.2GHz, when only a few cores were active, but for stability I had to lock the Core i7-9700K down to 5.1GHz—100MHz higher than a typical i7-8700K overclock, and the same as what I've managed with the cherry picked i7-8086K. I also needed a -2 AVX offset, as anything more than 4.9GHz caused AVX workloads to fail, and even 4.9GHz tends to run into overcurrent protection. I think part of the problem with the solder TIM is that the overall package height hasn't changed, which means Intel needs a fair amount of solder sitting between the die and the heatspreader. Unlike the 9900K, I didn't see thermal throttling using my test system, with maximum CPU temperatures topping out at 75C. Perhaps a different motherboard or more time tweaking could unlock higher clocks, but I've included my modest overclocking results in the benchmarks below. The new Z390 testbed in all its glory. My Core i7-9700K testbed is the same as for the Core i9-9900K. It includes the latest Nvidia's 416.34 drivers for the GTX 1080 Ti Founders Edition, all the current versions of the games, and Windows 10 October 2018 update. (I manually updated before Microsoft pulled the release, and thankfully haven't encountered any issues.) I've tested 10 games at 1080p 'ultra' quality, which is typically maximum quality, but sometimes with AA or some other settings stepped down a notch. The goal is to emphasize CPU limits in gaming performance, while still using reasonable settings for the hardware. For non-gaming tests, I've updated to the latest versions of all the software suites. All tests are 'real-world' applications that are publicly available, and these tend to be skewed toward multithreaded workloads. Cinebench 1T is the only single-core benchmark, and it continues to provide a reasonable look at individual core performance. Starting with gaming performance as usual, the Core i7-9700K comes in just a hair behind the Core i9-9900K. I did retest a few games, to confirm performance on the 9900K, and the results here are consistent. At stock, the 9700K is about one percent slower than the 9900K, and overclocked the difference is splitting hairs. The 9700K even claims a few wins, and with a margin of error of 1-2 percent in most games, there's no need to worry about gaming performance. Relative to the Core i7-8700K, the loss of Hyper-Threading is more than offset by the additional CPU cores. Core i7-9700K is a few percent faster than the 8700K, and a bit more than 10 percent faster than the 2700X. It costs the same as the former, and about $100 more than the latter once you factor in the price of a cooler. But if you're building a primarily gaming PC, I'd still go with one of Intel's CPUs. Switching to non-gaming multithreaded application benchmarks, things don't change too much. The Core i7-9700K still beats AMD's Ryzen 2700X in most benchmarks, with Cinebench and H.264 encoding still favoring the 2700X. The 7-zip decompression benchmark also favors AMD's 2700X, but in real-world compression/decompression it's a different story—I routinely measured significantly lower performance when decompressing about 5GB of data using Ryzen. That warrants a bit more explanation. Many workloads run primarily in a CPU's L1 or L2 cache, so memory latency and other factors are less relevant. Cinebench is a great example of this sort of test. Compressing/decompressing files is different. The built-in 7-zip benchmark isn't nearly as complex as real files and typically depends a lot more on a CPU's cache, but compressing/decompressing larger sets of files can create a lot of pseudo-random memory accesses. Games also tend to work with larger data sets and depend more on memory performance and latency. Not coincidentally, both tests strongly favor Intel's processors. The difficulty is in assessing the value of these application benchmarks. Truthfully, when was the last time you waited on your CPU for a CPU intensive application? Video editing certainly can tax even the burliest of systems, but outside of that I routinely accomplish all my 'work' on a 4-year-old laptop running significantly weaker hardware. I turn to my desktop PCs for gaming and video, but the benefit of mobility has me on a laptop for nearly everything else. Basically, you want to carefully consider your routine workloads and bottlenecks. If you're a professional user that actually does 3D rendering or video work, you can make a good case for upgrading to a faster processor—even the beastly Threadripper and Core i9-7980XE (or more likely a Xeon) are viable. Gaming performance would be a secondary consideration at best. But for most consumers, the relevance of application benchmarks is becoming harder to justify. To help with visualizing the big picture, I have two aggregate charts I like to use. The first, shown by default, is for multithreaded CPU scaling. This is most useful for people that run professional applications like CAD/CAM, ray tracing or path tracing tools (eg, 3D Studio Max, Cinema 4D, Maya), and/or video editing packages (eg, Premiere)—or anything that might result in a similar multithreaded workload, like livestreaming a game and using CPU-based encoding for the video. This chart gives equal weighting to each result of the Cinebench nT, H.264, H.265, VeraCrypt, and y-cruncher scores. The second chart looks at the full spectrum of CPU performance. It includes all the individual CPU tests (including Cinebench 1T and the 7-zip built-in benchmark), plus the average and average minimum gaming performance results. It's the best approximation I have for CPU performance, distilled down to a single number. Looking at multithreaded benchmarks, Core i7-9700K is 11 percent faster than the Core i7-8700K and only 4 percent faster than Ryzen 7 2700X. In the overall ranking, it's 8 percent faster than the i7-8700K and 9 percent faster than Ryzen 7 2700X. Those are relatively marginal gains, but basically what I've come to expect from each new generation of CPUs. We'll see if the 3rd Gen 7nm Ryzen parts can break that trend next year. Intel's high-end consumer market ends up as an effective tie between two alternatives. 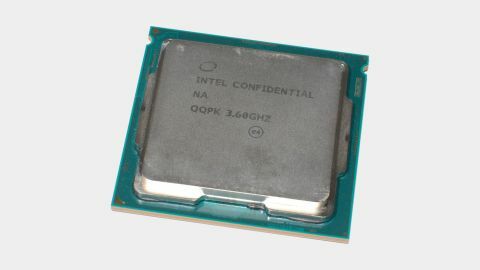 On the one hand sits the Core i9-9900K, with slightly higher clockspeeds and Hyper-Threading providing more performance in heavily threaded workloads, but with power requirements that require beefier cooling. On the other is the Core i7-9700K, with nearly identical gaming performance (really, you wouldn't notice the difference) and lower, more acceptable cooling requirements. Cost aside, both are great CPUs, and if you're building a new high-end gaming PC, they belong at the top of your list. But which one is better? The answer depends largely on the individual. If you never do anything with video editing or other heavy multithreaded workloads, save the $100-$200 you'd spend on the CPU upgrade and liquid-cooling solution and get the Core i7-9700K—and put any extra money into a better graphics card. Any differences in gaming performance are typically within the margin of error (less than one percent), and well below the 5-10 percent threshold where you'd notice without running a benchmark. But if you do any video editing or other CPU-limited tasks, I'd spend the extra money and get the faster processor. To be clear, I'm not recommending either the Core i7-9700K or the Core i9-9900K as a great upgrade option for someone who already has a relatively recent CPU, especially for gaming purposes. Even with a GTX 1080 Ti, everything from an i3-8100 (i5-6500) and up will run quite well in most games, doubly so if you're running at 1440p. The same goes for Ryzen processors: Ryzen 5 1600 and newer should be fine. With an upper-midrange graphics card like a GTX 1070 running 1080p ultra or better settings, the CPU becomes even less of a factor. But if you're thinking about building a new gaming PC, Intel's 9th Gen Core processors belong near the top of the list. Building a new PC also puts the cost in perspective. The Core i7-9700K, including a decent cooler, runs about $450—that's 50 percent more than a Ryzen 7 2700X, and the 9700K is only 12 percent faster in games! But you don't just buy a CPU; you need the motherboard, memory, storage, case, power supply, and above all a good graphics card. Once you spec out a reasonable system, the $150 price difference between an i7-9700K and a Ryzen 7 2700X will likely amount to less than 10 percent of the overall price. Outside of games, Core i7-9700K looks a lot like the i7-8700K in overall performance. It's about 10 percent faster and almost the same price. It's also slightly faster than a Ryzen 7 2700X, though not enough that most users would really notice. If you care enough about CPU performance to warrant buying the i7-9700K, however, I think i9-9900K should also be on your radar. And for those that are looking for the best value, particularly with an emphasis on gaming performance, saving $100 and opting for the Core i5-9600K (review coming up shortly) is another viable option. The great thing is that we have a lot of choice when it comes to modern processors. A good CPU should be able to carry you through multiple generations of graphics cards, and the Core i7-9700K will certainly do that. There are multiple options from AMD and Intel for every market, with prices ranging from around $100 to $1,000. Increased competition from AMD has helped with Intel's 'generous' core counts. We no longer need the more expensive 'enthusiast platform' motherboards and more RAM just to get a 6-core or 8-core processor, and with 8-core now becoming 'mainstream,' there's a better chance that future applications and games will start putting those extra cores to use.